MetaStock Real Time trading technical analysis for Xenith is specifically designed for intra-day data to transact in real-time throughout the trading day..
Kelly Clement presents a comprehensive overview of MetaStock XVI, featuring Offline Mode & Local Data. MetaStock Real Time helps you create a system for trading. Your approach to trading your portfolio should be a systematic, objective plan to make the best possible decisions. MetaStock is used by money managers & institutional traders across the globe. With MetaStock, you have access to the same tools that financial professionals trust to make their trading decisions. Why Do Most Traders Fail? Hundreds of thousands of people all over the world trade stocks, options, commodities, FOREX, and more. All of these investors hope to be successful, but the fact is, most are not. The reasons for failure in the market are as varied as the traders themselves, but for the great majority it comes down to their approach to trading. When traders allow emotions like greed and fear to play in their decisions, they are bound to fail. Also, relying on hunches, guesses, tips from friends, or even the advice of your broker are likely to lead to disappointment. Successful traders have several things in common. One, they leave emotions out of their trades. Two, they know that not all trades will be winners. Their goal is to beat the odds and make a majority of winning trades. Three, they have a plan. They manage their funds and never trade more than they should. Finally, many traders use Technical Analysis - the science of trading. What is Technical Analysis and how can it help your trades? “Technical Analysis” is a complicated-sounding name for a very basic approach to trading. Simply put, it is the study of security prices in order to make better trading decisions. The primary tool of the technical analyst is a chart showing price and volume. By identifying patterns over time, technical analysts are often able to predict the direction of the market, and specific securities. Of course no one can predict the future, but remember successful trades are about beating the odds and making more winners than losers, and protecting one’s profits. Technical Analysis provides that edge to a great deal of successful traders. In the pioneering days of technical analysis, charts were painstakingly hand drawn. Fortunately computers now perform the tedious aspects of charting. To be sure, many charting software programs have come and gone, but MetaStock has set itself apart for over 27 years as the choice of serious traders. Simply put, MetaStock is a tool for traders to analyze the markets on a sector, industry group, and security level. It uses charts and indicators to help you decide when to take and when to exit trades. Specifically designed for real-time traders—traders who use intra-day data to transact in real-time throughout the trading day, MetaStock Real Time is the perfect analysis tool whether you're an experienced, active trader or just beginning to trade the markets. 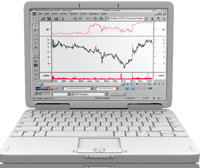 MetaStock stock charting software contains powerful analysis tools to help you make informed decisions about what to buy & sell and when to execute to make the most money possible. MetaStock Pro comes with many out-of-the box trading solutions that are reliable and easy to use. And if you want to take your analysis to the next level, our technical analysis software gives you the ability to customize these solutions to your particular trading style. Once you purchase the software it is yours to keep. However, before you purchase MetaStock Real Time you will need to decide which datafeed you will be using. The latest version of MetaStock Daily Charts is the result of years of research and client feedback. It focuses on making the process of end of day technical analysis charting and analysis as intuitive as possible. Watch the video: What's New in MetaStock 14. The Power Console takes everything that is great about MetaStock and puts it in one convenient location. Now you can open a chart, start a scan, run a test, review reports, make custom lists, and more… from one full-featured dashboard. MetaStock works exclusively with DataLink to provide your MetaStock charts and analysis with industry-leading data that's accurate, clean, and dependable. So you will now have daily data available sooner after the close of the markets. Maintaining your local data is always a challenge. With Full-time Data on Demand, you no longer need to worry about whether or not you have the latest possible update. Every time you open a chart, MetaStock loads the latest data for that security automatically. All the latest price and volume information is there, as well as error correction and split information. It's never been easier to keep the latest, greatest version of MetaStock on your computer. Software upgrades update automatically as they become available. Also you no longer have to visit our website to update your symbol database. It updates periodically with the click of your mouse. Page Layouts help you save time and stay organized. Save all of your on-screen charts together like pages in a book. So whenever you open your layout, the same securities appear. Templates also save you time by applying the same set of indicators and studies to different securities. Rotate through different securities while keeping the same indicators and line studies on the screen. Built-in toolbars let you easily refresh data, change periodicity, rescale the Y-Axis, zoom in & out, choose "previous" or "next security" in the open folder, and choose a security to open. The Object Oriented Interface allows you to click on an object and get an instant menu for that item. The Click and Pick/Drag and Drop features let you drag price plots, indicators, text, and lines from one chart to another. The MetaStock Explorer - Scan the Markets to Find Winning Securities. The MetaStock Expert Advisor gives you the input of industry professionals when and where you need it. Display the industry's most popular systems and charting styles with the click of a mouse. Need more info? Choose the commentary screen for specific information about the security you are charting. For example, you can learn: "What is a MACD and where should the buy and sell signals occur on the chart?" You can even create your own system using the easy-to-learn MetaStock formula language. Expert Alerts keep you in touch with current trading conditions. Use simple price and volume alerts or complex indicator triggers and multiple condition alerts. Expert Commentary shows you in great detail how your expert assesses the chart you are viewing. Is it a buy, sell, or hold situation? If so... Why? You get insight gained through years of research and real-world trading. Expert Symbols and Trends – Buy and sell arrows, text, or any other symbols in the MetaStock palette automatically flag special conditions, according to your criteria. With The Enhanced System Tester, create, back-test, compare, and perfect your strategies before you risk any of your money in the markets. System testing helps answer the question, "If I had traded this security using these trading rules, how much money would I have made or lost?" The surest way to increase your confidence in a trading system is to test it historically. The Enhanced System Tester lets you take a group of stocks and compare them to a group of trading systems to find the best scenario. Designed to simulate real trading scenarios, the Enhanced System Tester allows you to change variables such as entry, exit, order sizes, commissions, and more. This tool gives you incredible customization, comprehensive results, and detailed reports so that you can find the most historically successful trading scenario. The Enhanced System Tester gives you the power to take huge amounts of past data and use it to analyze and predict what trading systems will be the most profitable. Analyze the market with the insight of the most respected traders in history with MetaStock's comprehensive collection of indicators and line studies – over 150 are included. MetaStock's built-in indicator interpretations even help you understand how to trade each indicator. For advanced users, The Indicator Builder lets you write your own indicators. Standard indicators use a fixed look-back period, which makes them less responsive to prevailing market conditions. 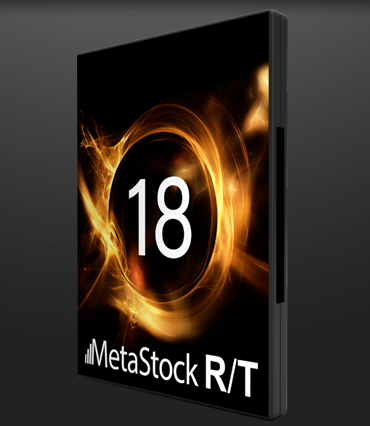 MetaStock 13 incorporates 42 Adaptive Indicators with dynamic look-back functionality based on volatility, cycle, or a combination of both. This method provides the most responsive and accurate results. MetaStock knows that many of our clients have their own ideas about what makes a great system. The MetaStock formula language is easy to learn and allows you to create just about any system you can think of. Not into programming? Tell us what you want and we'll do it for a nominal fee. Find out more about custom formula requests. Intellistops - these self-adjusting trailing stops do away with the old static stop systems, which are set at a fixed percentage from price. Intellistops are adaptive and adjust dynamically based on the current price activity of the security. Intellistops adjust according to cycles, volatility, and other conditions. Chandelier Stops - As the name indicates, Chandelier stops "hang" the sell stop from the extreme high reached over a predetermined period. When used properly, in tandem with other trading systems, Chandelier stops have been shown to produce profits even with randomly selected entries on a diversified group of futures. This revolutionary trend-based system was developed by Rahul Mohindar. It incorporates a three-step indicator triggered by the Rahul Mohindar Oscillator and has become one of the most popular systems in MetaStock for its ease of use and reliability. We added state-of-the-art exploration tools to 10 of these systems. These explorations perform system testing - on not just one security - but over an entire database of securities. Plus, you'll get buy/hold vs. buy/sell comparisons, and buy/sell alerts to further assure your trade has the highest probability of success. MetaStock has over 150 built-in indicators and line studies to help you analyze market movement - all easy to place on a chart with a simple drag-and-drop. MetaStock's built-in indicator interpretations even help you understand how each indicator can be traded. And each indicator's parameters can be easily adjusted to what you think works best. Kelly Clement presents a comprehensive overview of MetaStock XV, featuring Offline Mode & Local Data. This brief video presented by Scott Brown, President of MetaStock, discusses the MetaStock FORECASTER. This is a brief introduction to Refinitiv XENITH, the latest real-time data, news and analysis package from MetaStock. This section applies to the "XENITH and MetaStock RT" products only. 32-bit messaging application program interface compliant email program (For example: Outlook, Thunderbird, Eudora).